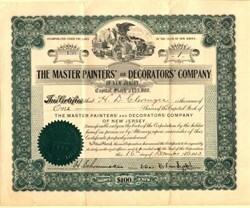 Beautifully engraved certificate from the Master Painters' and Decorators' Company issued in 1913. This historic document has an ornate border around it with a vignette of an eagle, train, bee hive and a ship. This item is hand signed by the Company's President and Secretary and is over 92 years old. Cave paintings, although primitive, are the earliest form of mural decoration known today. Whilst the purpose of these decorations can only be speculated upon, most theories assert a degree of skill involved in their creation, a skill which is carried through in the trade of the house painter. The Act legislated for a seven year apprenticeship, and also barred plasterers from painting, unless apprenticed to a painter, with the penalty for such painting being a fine of �5. The Act also enshrined a maximum daily fee of 16 old pence for their labour. Enforcement of this Act by the Painter-Stainers Company was sought up until the early 1800s, with master painters gathering irregularly to decide the fees which a journeyman could charge, and also instigating an early version of a job centre in 1769, advertising in the London press a "house of call" system which allowed masters to advertise for journeymen and also for journeymen to advertise for work. The guild's power in setting the fee a journeyman could charge was eventually overturned by law in 1827, and the period after this saw the guild's power diminish, along with that of the other guilds; the gulds were superceded by trade unions, with the Operative United Painters' Union formed sometime around 1831. In 1894 a national association formed, recreating itself in 1918 as the National Federation of Master Painters and Decorators of England and Wales, changing its name once again to the British Decorators Association before merging, in 2002, with the Painting & Decorating Federation to form the Painting & Decorating Association. The Construction Industry Joint Council, a body formed of both unions and business organisations, today has responsibility for the setting of pay levels. This concept carried forward in the states to help establish quality standards for painters and decorators.